Don't jump around without the right shoes. If you're serious about sports, plyometrics can propel your athletic performance to the next level. This type of exercise was created for competition at the top global level: the Olympics. Whether you're on a college team or training for professional sports, plyometrics can give you an edge by adding power and enhanced control to your moves. Since your feet take the brunt of each landing, wearing the correct shoes is vital for safety -- the wrong footwear can leave you stranded on the sidelines instead of strutting your stuff on the field. Plyometrics, hailing from Eastern Europe, is often referred to as jump training. That's because this exercise style focuses on springing actions in the legs, core or arms. Muscles are stretched and then contracted rapidly, training them to react quickly and powerfully during sports. Examples of plyometrics include jump squats, lateral jumps, multiple jumps, jump marches, arch chops and clap pushups. However, even moves as simple as hopping on one foot or skipping rope offer plyometric conditioning. When it comes to picking shoes for plyometrics, cushioning is key. These exercises are far from gentle on your delicate tootsies, and you need something to absorb the shock and protect those ligaments, tendons and tiny muscles. Forget about "barefoot" training shoes, or literally going barefoot for that matter. Instead, invest in a quality pair of cross-training or aerobics shoes with reinforced toes as well as padding under the balls of your feet. Pyometrics isn't for workout rookies. Do not even attempt a plyometric routine unless you are already flexible and strong. Otherwise, your body will not be equipped to handle the force of such intense moves. Before you show off with fancy jumps, ease into your routine by skipping and marching for a while. Gradually move on to lunging, and then try jumping in place. Eventually, take a stab at multiple jumps, lateral jumps and low box jumps. Plyometrics are not for the casual athlete, and there are plenty of risks involved. 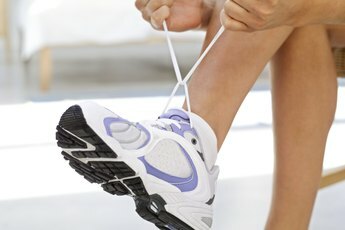 Consult a fitness professional before starting your routine, especially if you have a history of joint or foot problems. If you decide to go for it, avoid hard surfaces and instead train on grass or padding. Forget about jumping as many times as you can, and focus on practicing correct form to make each jump count. Land heel to toe for up-and-down jumps, using a rocking motion to ease the impact. Control your body to land as lightly as possible. IdeaFit.com: Look Before You Jump!